Back in 2014, Christopher Nolan released the ambitious but divisive sci-fi film "Interstellar". In perhaps its most pivotal scene, Anne Hathaway's character poses a far-fetched theory to save the world from impending apocalypse. She essentially explains that the power of love, rather than science, is the answer to their predicament, representing a higher dimension we can't perceive. Two years later, this character's philosophy reverbates in a kindred spirit of sorts in Louise Banks, the lead character in Denis Villeneuve's equally heady sci-fi drama "Arrival". As unexpected alien spacecraft emerge across the world, her character attempts to solve the puzzle using the more intangible elements of humanity like language, versus the hard "facts" of science. 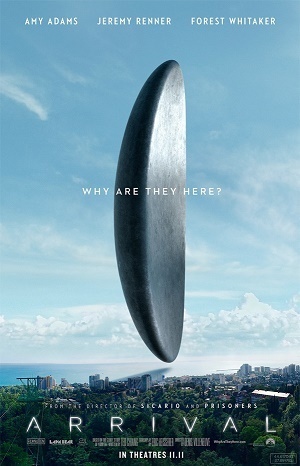 Set in an undisclosed time period, "Arrival" centers around Banks (played by Amy Adams), a leading linguist whose skills have afforded her high level security clearance with top intelligence and military agencies in the past. One day, she is called out of her university teaching job yet again, as unidentified spacecraft have appeared at several sites across the globe. Inside are alien species, which become termed as "heptapods", speaking an unrecognizable language. Fearful of an aggressive invasion, Banks is recruited by the U.S. military to co-lead a team (alongside Ian Donnelly, played by Jeremy Renner) in Montana to decipher a way of communicating with the aliens. By combining her linguistic background with Donnelly's scientific prowess, they hope to get an answer to a fundamental question. What is the aliens' purpose on earth? Their subsequent research proves to be a massive undertaking, as the aliens' language seems far more complex and symbolic than the typical human alphabet. But even more importantly, time is of the essence, as research teams at other international sites become increasingly suspicious of the aliens' intentions. This race against the clock establishes a platform for director Denis Villeneuve to impose some visually and intellectually stimulating ideas. From the abstract language of the aliens, to the mysteries surrounding their presence, the film creates its own alternate world as befitting its genre. But whereas many sci-fi films are characterized by elaborate futuristic visuals and complex theories to make your head spin, "Arrival" offers a refreshing change of pace. Its production design takes a minimalist approach, relying heavily on a single visual motif (the spacecraft), while the focus on language ensures a relatively straightforward narrative. Under its stripped down indie surface is a film with a whole lot to say however. Indeed, the premise instantly recalls the Biblical Tower of Babel, where the emergence of different languages was believed to be a curse from God for man's disrespect. And that tension is made palpable in the film, as miscommunication between man and alien, as well as between citizens of different nations, threatens potential war. As such, it is a sobering reminder that humanity is always on the verge of self-destruction, often due to our inability to communicate effectively and our mistrust of each other. Eric Heisserer's screenplay (a surefire contender for Best Adapted Screenplay) truly gives you a lot to think about long after the film's utterly profound climax. As Banks makes progress with each new breakthrough, the film also enters increasingly emotional territory (handled with aplomb by Amy Adams, possibly heading for another Best Actress nomination). At the risk of spoiling its brilliantly moving conclusion (an epilogue worthy of Best Picture and Best Director consideration in its own right), the film resonates with the deeper meaning behind its original title - "Story of Your Life". Under all the wondrous sci-fi accoutrements - look out for the film in Best Production Design, Best Sound Mixing, Best Sound Editing and Best Original Score - "Arrival" is ultimately a human story about the choices we make, the destinies we embrace and like Anne Hathaway in "Insterstellar", the people we love. Glad to hear the film has a whole lot to say. I hope there's originality in Arrival and not just homage to sci-fi of old. Seeing it soon!